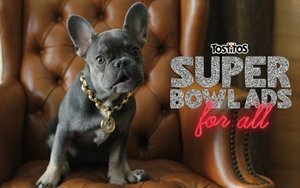 Super Bowl Ads for All, a digital tool launching today on Tostitos.com, lets users create invite videos “of the same caliber as a Super Bowl ad,” promises the brand. Users who enter the host’s name, party location and time can choose and mix content featuring themes from past Super Bowl ads, including “an obligatory talking baby,” puppies, explosions and nostalgic celebrity cameos. Speaking of nostalgic celebrities, all videos created also include Alfonso Ribeiro — current host of "America's Funniest Home Videos" and a star of past TV shows including “Fresh Prince of Bel-Air. Overall, the tool is capable of generating hundreds of different combinations. The footage of Ribeiro and the generic-theme subjects were shot by the creative agency, Goodby Silverstein & Partners. Consumers who create video invitations are offered a buy-one, get-one-free Tostitos dip coupon. The brand will also feature the invite technology — and an appearance by Ribeiro — at its cantina-style experience at the Super Bowl Live fan event to be held at Minneapolis’s Nicollett Mall in the 10 days leading up to the game. Last year, Tostitos’s Super Bowl marketing focused on a partnership with Mothers Against Drunk Driving that offered discounts on Uber rides on game day. The offer was promoted through a video featuring real stories of people who have lost loved ones to drunk driving accidents — some after Super Bowl parties — and a small number of Tostitos bags rigged to be capable of detecting alcohol on users’ breath and flashing a “don’t drink and drive” warning.